The European Commission has signed a $1bn (£602m) development pact with Nigeria, aimed at tackling corruption and promoting peace. A substantial amount of the funding will be spent on resolving conflict in the oil-rich and crime-plagued Niger Delta, the EU's development chief said. The money will also target electoral reform and improving human rights. But correspondents say many Nigerians will doubt the money will get to its intended targets. The BBC's Caroline Duffield, in Lagos, says corruption touches the lives of everyone in Nigeria and leaves the vast majority of people in poverty. And she says many Nigerians believe the current government is losing the fight against corruption. Almost a third of the EU money is devoted to the Niger Delta region. 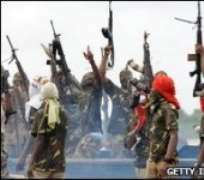 For years militants have blown up pipelines and kidnapped foreign oil workers, demanding a fairer share of the wealth. "I'm delighted that a substantial amount of this financing will go to support conflict resolution and the peace process in the Niger Delta which has been ravaged by years of unrest," said the EU's development commissioner Karel De Gucht . Over the past few months, thousands of militants have given up their weapons in an amnesty deal offered by the government in return for the promise of education and jobs. A three-month respite from the violence has brought back some oil and gas production, but sceptics fear the former fighters could resume violence if they do not quickly find work.